Practical method of monitoring avian, reptilian and mammalian body temperature during anesthesia and surgery. The thermometer measures minus 40 to 300 degrees F (minus 40 to 150 C) and is highly accurate. It is easy-to-read with constant digital readout. 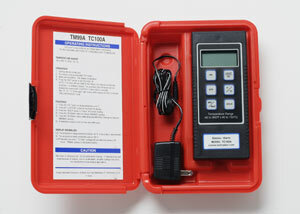 Available in Rechargeable and 9-V Battery operated units, each measuring 7" x 3" x 1". Plastic carrying case included. Battery operated unit includes one 9-V alkaline battery. Each unit comes with one 18" VSP Exclusive Flexible Probe with a heat sensor at the tip.